NEFAF is back! The New England Fall Astronomy Festival is this weekend, September 9 & 10 (Friday and Saturday) at the Durham campus of University of New Hampshire. 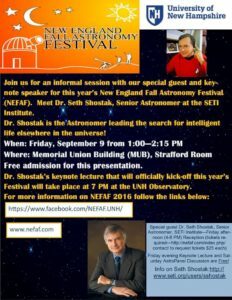 This year’s special guest and keynote speaker is Dr. Seth Shostak (SETI). He’ll be talking to students and faculty on Friday, September 9th at 1:00 PM in the Strafford Room on the UNH-Durham campus and also giving the Keynote Address from 7:00-8:15 p.m. at the Main Tent at UNH Observatory. There are tons of activities on the schedule for kids (building rockets!) this weekend, in addition to lectures from notable amateur and professional astronomers aimed at the adults in the crowd. Don’t miss the Saturday afternoon discussion panel with John Gianforte (The Sky Guy), Dr. David Kipping, Dr. Seth Shostak, Dr. Suzanne Young, and Dr. Harlan Spence. And stick around: S&T‘s Kelly Beatty will be talking about the 2017 total solar eclipse. On Friday night, Joel Harris will give a tour of the night sky for novice observers. Marc Stowbridge will be giving the Saturday night sky tour. I’ve been looking at the sky my entire life, and I still haven’t gotten tired of listening to/watching sky tours. The UNH Observatory will be open, so this is your chance to look through a 14-inch telescope. I’m reprinting the full NEFAF schedule here, but you should check out the NEFAF facebook page for more details. 10:00-6:30 PM: Search the NEFAF Universe for Clues! NEFAF AstroScavenger Hunt! Start your hunt in the Main Tent. 10:00 AM: Raffle Ticket Sales Open – Front Gate, Main Tent near microphone and roving sales throughout the day! 11:00 AM: Bob Villeux NHAS Rocks From Space! 4:35 PM: John Blackwell Phillips Exeter Academy A Look at LARGE Telescopes in Chile!